Foreign pieces of DNA are found in the genomes of many animals – these ‘Genomic parasites‘ are pure, genome hopping pieces of DNA code which embed their lifecycle within the DNA in our own cells. You could call this genomic parasitisation a form of genetic modification, just as scientists in labs the world over use simple molecular biology techniques to insert useful genes into genomes to better understand biological processes. However, most of the time, genomic parasites like transposons have no function in their hosts and simply hitch along for the ride, reproducing as the host reproduces. This doesn’t fit our usual understanding of the meaning of genetic modification, which involves humans and active manipulation of the genome, in most cases to improve it. However, a recent piece of research shows another form of natural genetic modification which also doesn’t involve humans – and this form does affect the life of the host and can confer some advantage. Jean-Michel Drezen and colleagues had previously discovered a genomic parasite that resides within the genome of wasps, specifically an amazing group of wasps that lays their eggs inside of living caterpillars, known as parasitoid wasps. 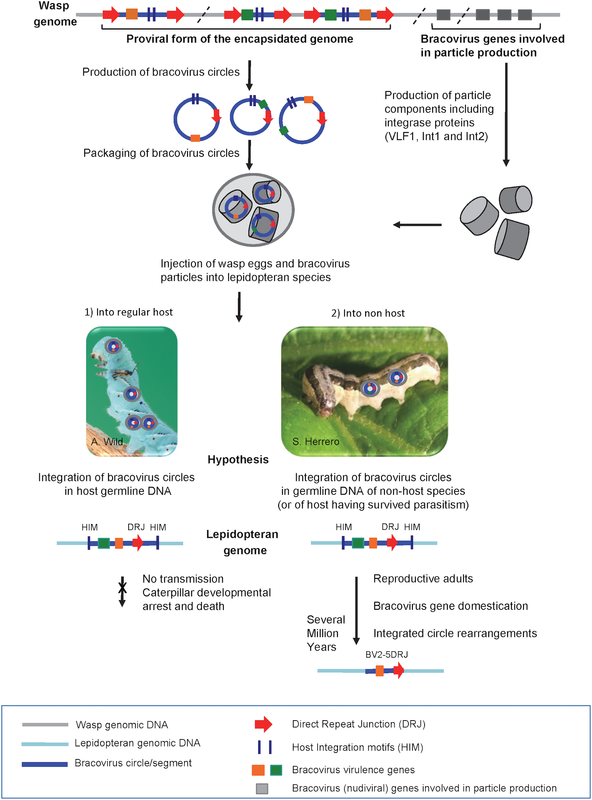 This genomic parasite, a bracovirus, has, unlike transposons, lost the ability to replicate by itself, and is fully integrated into the wasp genome. However, these bracoviruses are not dormant: the wasps take advantage of the viruses ability to invade host cells during their eggs’ development within the caterpillar – an evolved symbiotic relationship between the virus and the wasp. Female wasps produce millions of virus-like particles in its ovaries and injects them along with the eggs. The viruses invade host cells and integrate their DNA into the host’s genome, taking along some wasp genes that disable the caterpillar’s immune system. The caterpillar is put at a significant disadvantage, allowing the developing wasp larvae to devour it from the inside, eventually hatching out, Alien-style. A brutal but effective way of ensuring the baby wasps are able to develop. Sometimes the wasps lay their eggs in the wrong species of caterpillar and the eggs’ development fails. In this case, the caterpillar survives. But the virus has still invaded the cells of the caterpillar, and will have integrated itself and the wasp genes into the caterpillar’s genome. If the virus has invaded the developing egg or sperm cells of the caterpillar, the genes of the virus, and of the wasp, can be passed on to the next generation, in the same way that the father or mother’s genes are passed on through sperm and eggs. This is the scenario that Drezen and colleagues discovered in the monarch butterfly, they of the magnificent multi-generational migration between the United States/southern Canada and Mexico, the silkworm/silkmoth, the beet armyworm and the fall armyworm. They all have bracovirus and wasp genes in their genomes – they are natural transgenics (the term given to animals containing genes from other species), generated by a wasp, not a human. Fortunately for these butterfly species it isn’t all bad news. Some of the bracovirus genes can give the caterpillar resistance to another deadly strain of virus, the baculovirus. In this respect the parasitised butterfly really does resemble a GM animal – it contains genes from another species that enhance its survival or give it an additional function. This GM animal has been produced by the evolutionary arms race between parasitic wasps and their butterfly hosts. So, if nature can produce GM animals, what does that mean for our acceptance of human-produced GM organisms? Drezen and colleagues hypothesis on the process leading to transfer of bracovirus gene sequences to butterfly genomes. If the caterpillar survives, its genome (Lepidopteran genome) contains elements from the bracovirus (coloured blocks and arrows). These then pass down through the generations just as any other piece of DNA passes down – through sperm and eggs and sexual reproduction. Millions of years later, these bracovirus elements are firmly part of the butterfly genome. Figure 10, Gasmi et al., 2015.